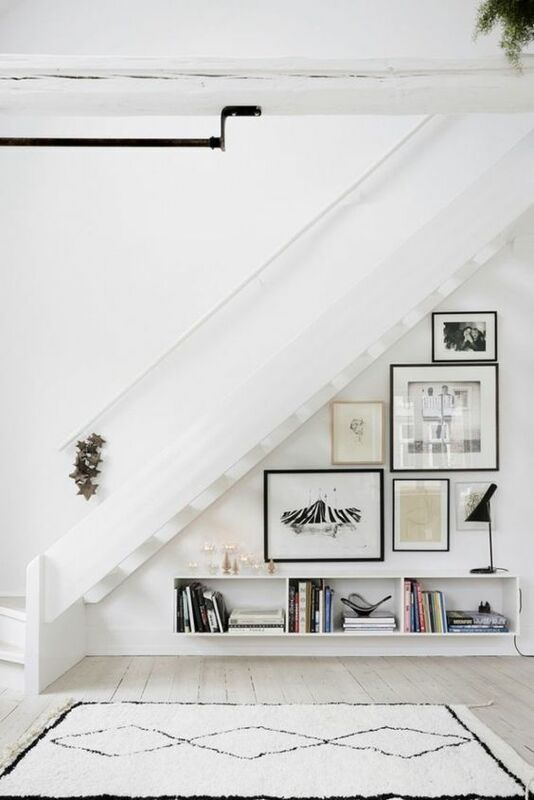 What are the ways to utilise the place under your stairs? It is perhaps the most regrettably unused places in your homes. Regrettable because its potential is underrated and it continues to be underutilised while it could be used for a plethora of purposes; giving your home an innovative and magical feel. One of the hallmarks of good interior designing is the clever and practical utilisation of space whilst also making it look aesthetic. 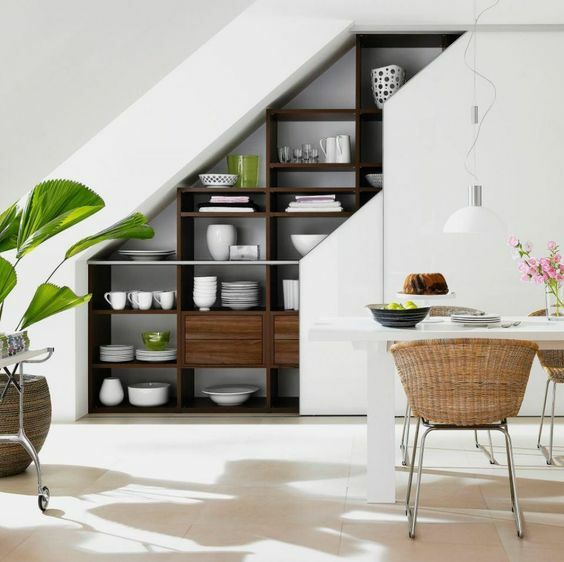 Considering that there is an abundance of unused spaces in our homes, getting a professional expert to work on those would transform your home into something well-organised and appealing. The place under your stairs remains to be one of the most neglected, if not the most neglected. However, as aforementioned, you could tap into its limitless potential, get creative and see the amazing results for yourself. The ways to utilise the place under your stairs can range from turning it into a pantry or using it as a washing-machine cabinet. It could solve the predicament of having too many things, as it can be efficiently utilised for storage. However, if your woes aren’t about storage, you could always use it as a shoe rack. Create a Relaxing Den – Turn that place into your favourite seating spot by using a bench and some shelving. You could stack your novels, coffee mugs, wine bottles; and unwind after a day of hard-work. 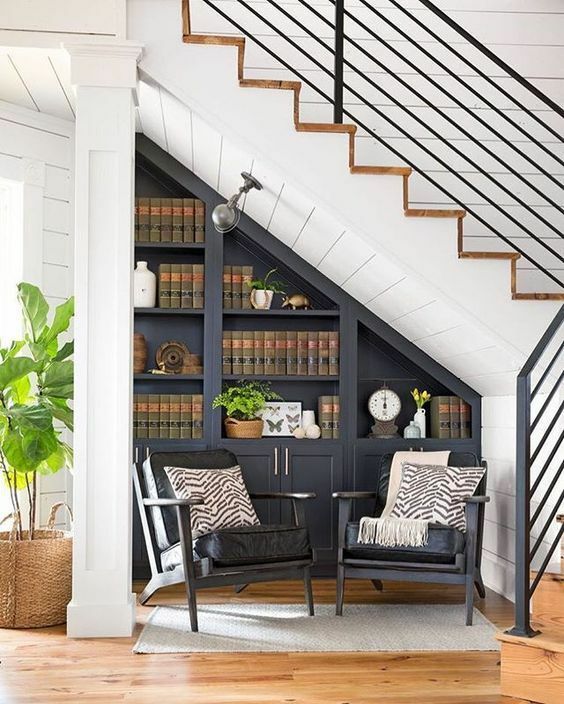 Bookshelf – Transforming the place under your stairs into a bookshelf is probably one of the best transformations ever. 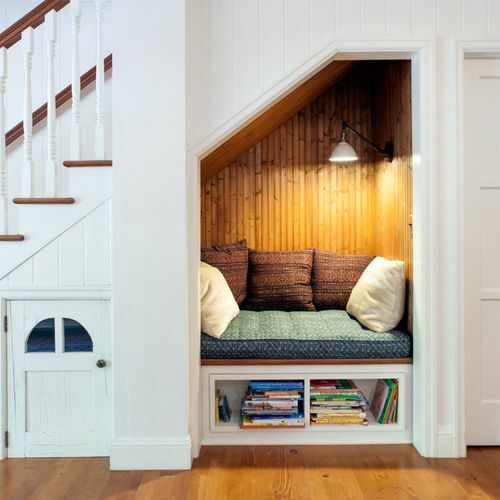 You could design it in any manner and also make a cosy seating spot for yourself making it your own tiny library. Crockery Cabinet – If you don’t find enough room for all your beautiful crockery, you can always build a storage place under your stairs and keep them there. After all, there’s no such thing as too much crockery. 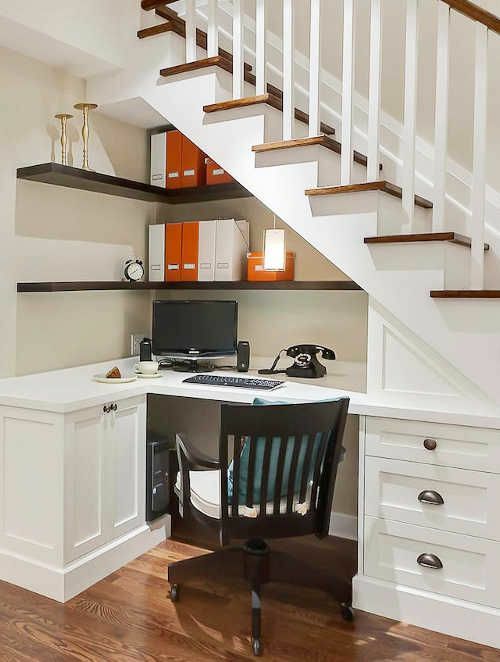 Home Office –You can make a home office by modelling the space underneath your stairs to build yourself a comfortable and warm working place. 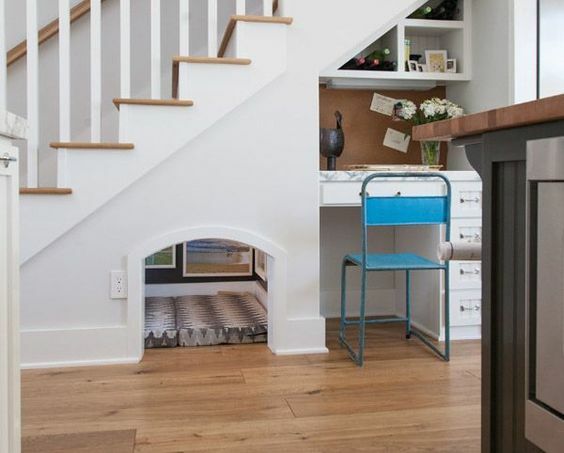 Build a Dog Kennel – Besides storing your dog’s food, clothes and toys; you could use all that space to give your beloved dog his own private place that he deserves. Aesthetics – If you don’t want to utilise the place under your stairs, there are other options available to make it look more aesthetic. 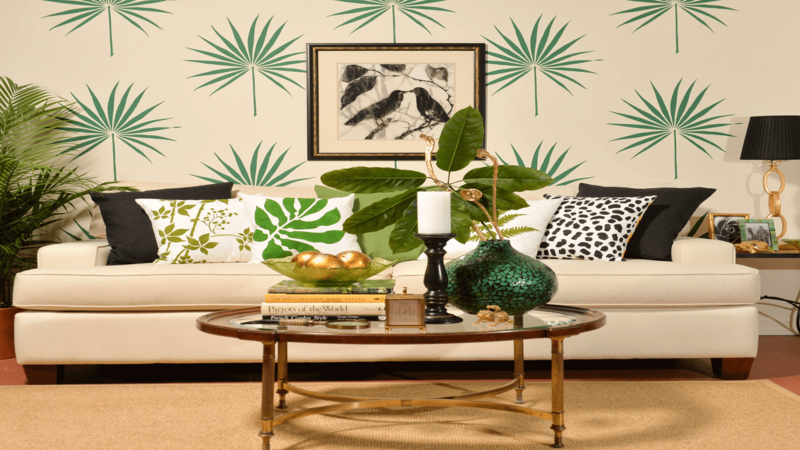 You can always hang paintings or family pictures, erect shelves to host decorative vases or convert that space into a miniature artificial waterfall. Bar Counter – Always dreamt of making a bar counter at your place? 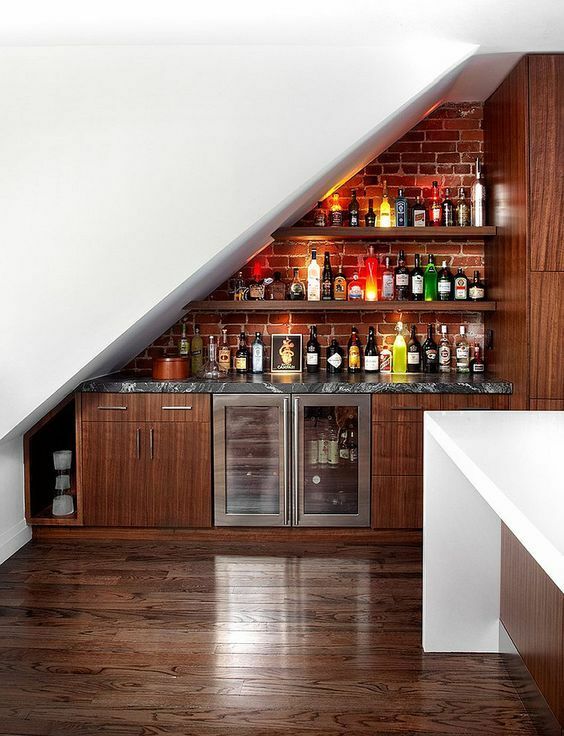 You can design it to store bottles and get two bar stools to finish the look and get the ultimate feel. 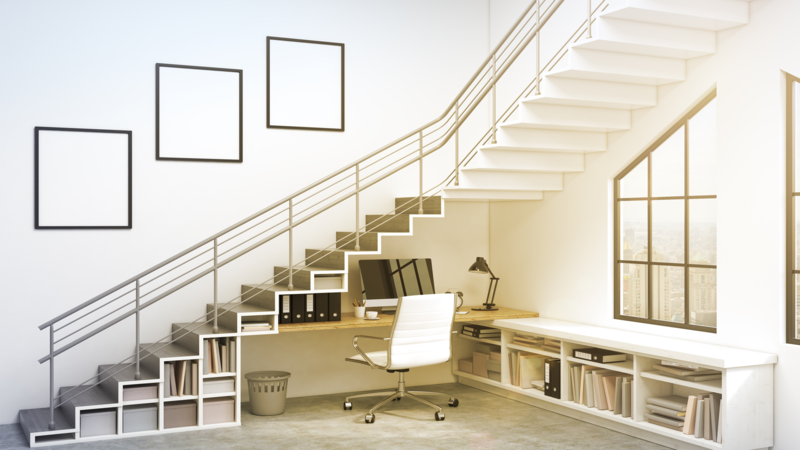 As you can see, there are numerous ways how the place under your stairs can be efficiently utilised. Getting an expert’s opinion can go a long way in understanding what option best suits your needs and goes with the overall feel of your home. So what are you waiting for? Contact us and we will transform the place under your stairs into something meaningful and beneficial.